It was to be the one and only cuddle Carolyn Isbister would have with her tiny, premature daughter. 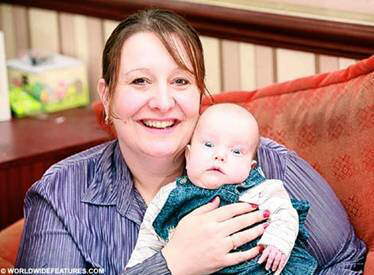 Rachael had been born minutes before - weighing a mere 20oz - and had only minutes to live. Her heart was beating once every ten seconds and she was not breathing.! 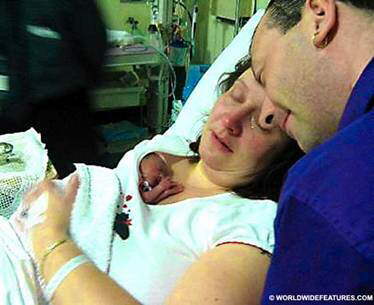 As doctors gave up, Miss Isbister lifted her baby out of her hospital blanket and placed her on her chest. She said: 'I didn't want her to die being cold. So I lifted her out of her blanket and put her against my skin to warm her up. Her feet were so cold. 'It was the only cuddle I was going to have with her, so I wanted to remember the moment.' Then something remarkable happened. The warmth of her mother's skin kick started Rachael's heart into beating properly, which allowed her to take little breaths of her own. Miss Isbister said: 'We couldn't believe it - and neither could the doctors.. She let out a tiny cry. 'The doctors came in and said there was still no hope - but I wasn't letting go of her. We had her blessed by the hospital chaplain, and waited for her to! slip away. 'But she still hung on. And then amazingly the pink colour began to return to her cheeks. Four months later, Rachael was allowed home weighing 8lb - the same as a newborn baby - and she has a healthy appetite. Miss Isbister and her partner David Elliott, 35, an electronics engineer, were thrilled when she became pregnant. At the 20-week scan at the Edinburgh Royal Infirmary, doctors told them she was carrying a girl and they decided to name her Rachael. But at 24 weeks a womb infection led to premature labour. Miss Isbister, who also has two children Samuel, 10, and Kirsten, eight, from a previous marriage, said: 'We were terrified we were going to lose her. I had suffered three miscarriages before, so we didn't think there was much hope.' When Rachael was born she was grey and lifeless. 'The doctor just took one look at her and said no,' said Miss Isbister. Ian Laing, a consultant neonatologist at the hospital, said: 'All the signs were that the little one was not going to make it and we took the decision to let mum have a cuddle as it was all we could do. Rachael was moved on to a ventilator where she continued to make steady progress. Miss Isbister said: 'The doctors said that she had proved she was a fighter and that she now deserved some intensive care as there was some hope. 'She had done it all on her own - without any medical intervention or drugs. 'She had clung on to lif e - and it was all because of that cuddle. It had warmed up her body enough for her to start fighting.' Because Rachel had suffered from a lack of oxygen doctors said there was a high risk of damage to her brain. But a scan showed no evidence of any problems. As the days passed, Rachael began to gain in strength and put on weight. She had laser treatment to save her sight because the blood vessels had not had a chance to develop properly in the womb. And she also had six blood transfusions. 'We couldn't believe that she was doing so well,' her mother said. After five weeks she was taken off a ventilator and Miss Isbister was able to breastfeed her. Then, after four months, the couple were allowed to take her home - a day they thought they would never see. Miss Isbister said: 'She is doing so well. When we finally brought her home, the doctors told us that she was a remarkable little girl. 'And most of all, she just loves her cuddles. She will sleep for hours, just curled into my chest. 'It was that first cuddle which saved her life - and I'm just so glad I trusted my instinct and picked her up when I did. Information in this message is confidential. It is intended solely for the person or the entity to whom it is addressed. If you are not the intended recipient, you are not to disseminate, distribute or copy this communication. Please notify the sender and delete the message and any other record of it from your system immediately.